Did you recently update a WordPress plugin, theme, or the WP core itself and receive a “Briefly unavailable for scheduled maintenance. Check back in a minute.” error? You are probably freaked out (like I was) too, right? No worries, let’s not waste any more time and jump into fixing this WordPress maintenance error. 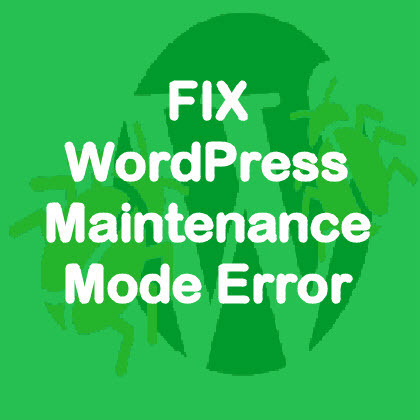 How to fix the WordPress maintenance mode error "Briefly unavailable for scheduled maintenance. Check back in a minute." Disclaimer: Please take a full backup of your website before proceeding, I cannot be held responsible or assist with technical troubleshooting. A few days ago I was updating a WordPress plugin and clicked the Dashboard icon upon completion. My heart sank when I received a white screen with the simple error message “Briefly unavailable for scheduled maintenance. Check back in a minute.”. So what did I do? I politely waited a minute as instructed and clicked refresh. I waited a few more minutes, cleared the caches, and refreshed again. At this point, I am starting to worry. Actually, I was pretty freaked out. I tried different browsers thinking it may be a session issue. Luckily, after a few minutes of searching and reading various forum posts, I found a simple solution. Access your website cPanel directly via your hosting account or FTP (this is where your website files are stored). Look for a file named “.maintenance” in your root, home directory, or in the ‘public_html’ folder. If you cannot find the file, use your cPanel’s search function. A confirmation popup will typically appear. Confirm the right file name displays and then confirm the deletion. At this point, your issue should be resolved. Refresh your WordPress admin panel or login again and everything should be back to normal. Here is a video to walk you through the process if you are still feeling unsure about how to make this change. What caused the 'briefly unavailable for scheduled maintenance. check back in a minute' error? WordPress goes into maintenance mode when you update plugins, themes, or the core platform. At this point, WP temporarily creates the ‘.maintenance’ file forcing visitors accessing your site to receive a ‘Briefly Unavailable’ error message advising they should check back shortly. This is normal as updates usually only take a few seconds and most visitors will never receive one of these errors. Once the update(s) is complete, WordPress deletes the ‘.maintenance’ file. However, in rare cases your update may fail due to timeouts, memory issues, slow server response times, or other reasons. When the update fails, WordPress essentially gets “stuck in maintenance mode” and requires manual intervention to fix it. Anyone with a website built on WordPress will at some point receive the dreaded “Briefly unavailable for scheduled maintenance. Check back in a minute” error. While stepping out of the click-to-configure WordPress interface may intimidate some, luckily this is one of those errors that is fairly simple to fix using the steps listed above. I hope this article helped you resolve your WordPress ‘briefly unavailable’ error quickly and efficiently. Did this article help you fix the WordPress maintenance mode error? If yes, can I ask a favor? Please help others find this article by sharing this article with your friends on social media, or link to this article from your website or blog.